Stingrays living in one of the world’s most famous and heavily visited ecotourism sites — Stingray City/Sandbar in the Cayman Islands — have profoundly changed their ways, raising questions about the impact of so-called “interactive ecotourism” on marine wildlife, reports a new study published March 18 in the journal PLOS ONE. 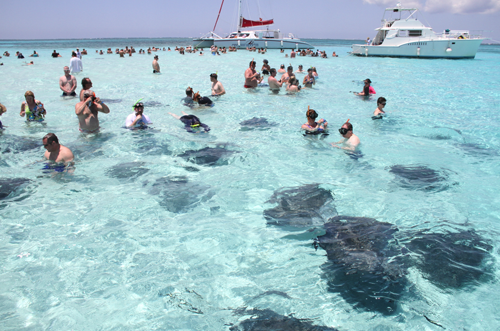 Researchers from Nova Southeastern University’s Guy Harvey Research Institute and the University of Rhode Island studied the southern stingray population of Stingray City — a sandbar in the Cayman Islands that draws nearly a million visitors each year to feed, pet and swim with its stingrays — to assess how the intensive ecotourism has affected the animals’ behavior. Wild stingrays are active at night and solitary — they forage through the night over large distances to find food, and rarely cross paths with other stingrays. To see if Stingray City’s fed stingrays stray from this behavior, Mark Corcoran, lead author of the study who did the research as part of his graduate work at NSU, and the research team tagged and monitored both wild and fed stingrays over the course of two years and compared their patterns of movement. These results suggest that human-provided food can dramatically change how even large, highly mobile ocean animals behave — with potentially serious consequences, the researchers conclude. Stingray City means big business in the Cayman Islands, where each stingray generates as much as $500,000 annually in tourism income, Harvey said. The team plans to continue to monitor Stingray City’s population to track its health — and the industry’s impact — over time.